A turret-styled bay window is showcased on a stone wall, while dormers and columns combine both country and traditional styles. French doors from both the great room and master suite access the rear porch, and up the U-shaped staircase, the two-story foyer has a decorative shelf for art and accessories. 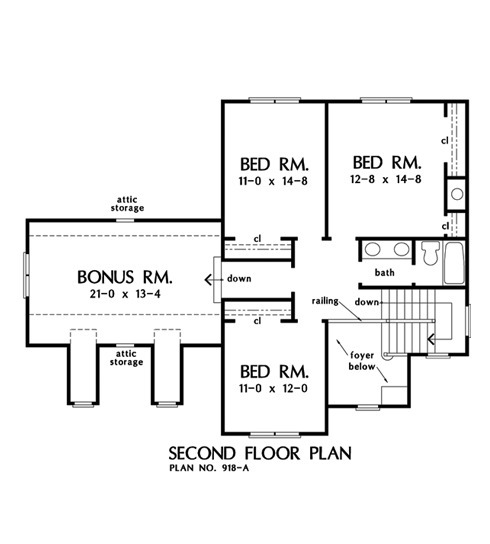 House Dimensions: 48' 4" x 51' 4"
Great Room : 15' 0" x 20' 0" x 9' 0"
Utility Room : 6' 4" x 7' 8" x 9' 0"
Bonus Room (Cathedral): 21' 0" x 13' 4" x 8' 8"
Master Bedroom (Tray): 14' 8" x 14' 0" x 10' 6"
Bedroom #4 : 12' 8" x 14' 8" x 8' 0"
Porch - Front : 16' 2" x 7' 0" x 0' 0"
Porch - Rear : 26' 8" x 7' 0" x 0' 0"
Storage (1st Fl.) (Sloped): 5' 6" x 3' 4" x 0' 0"
Foyer (2 Story): 5' 10" x 9' 0" x 18' 0"